Believe it or not, I found 2 sets of Pulls on Ebay for Sale, and You might want to keep Your Eye on Your Neighbor’s Trash at the Curb… You never know. See I found out that when Homeowners took the Metal Cabinets out of their Kitchens, and installed those Ugly Wood ones, the Metal ones would be put up in a Garage or down in the Basement for Tools or whatnot. The Woman in Philadelphia I bought My Metal Kitchen Cabinets from, had them just on top of each other in the back of Her House, because She re-did Her Kitchen. But trust Me… they are around both just the Pulls & the Complete Cabinets. P.S Craigslist is always a Great Tool to find them. I have just found your site and have been pouring over it for days! 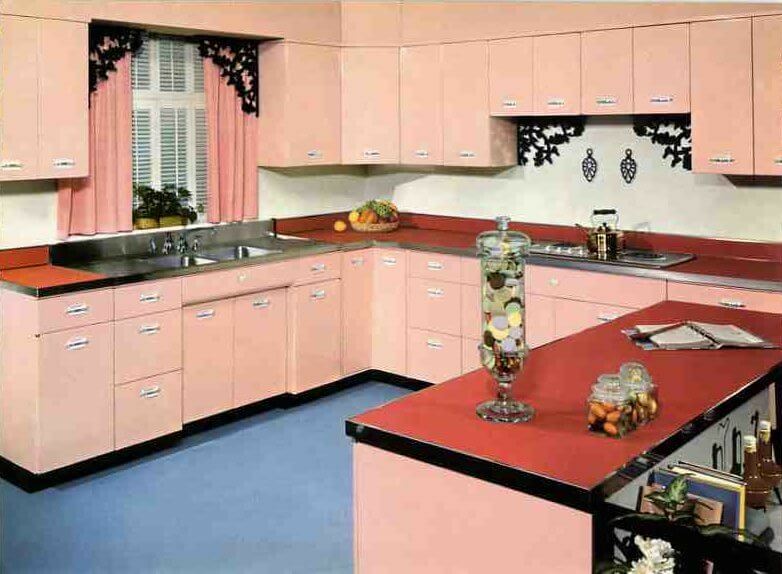 I am in the process of searching for my first home purchase and have always had a hankering for my grandmother’s metal cabinets that I remember from my youth – alas, they tore that house down when I was still too young to say, “Save those cabinets for me!” Imagine my delight when I found your website! Thank you for giving the past the respect it deserves. So many people automatically think old=bad and new=good. Sometimes yes, but more often the older products were right on target in form and function. 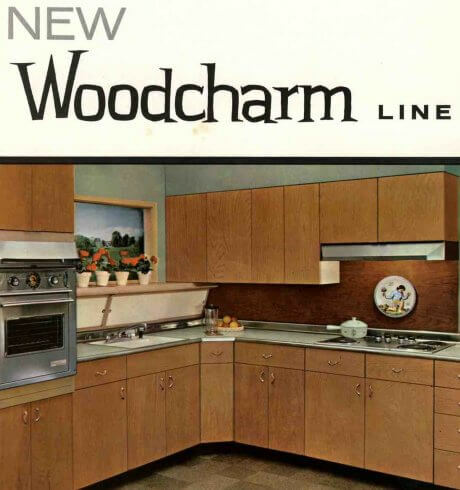 Anyway, back on subject… These Chevron or Boomerang handles were a signature of Youngstown (or Jamestown) cabinets? If so, I now know what cabinets my grandmother had! 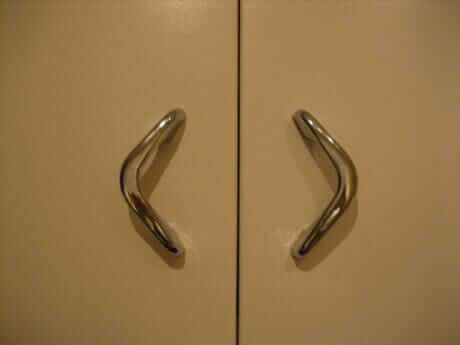 I have been trying to figure it out and wondered where to find those exact handles! Do you have any idea of what year the Boomerangs were introduced? Thank you Pam, you are my new kitchen guru! By the way, I see you are in Kentucky this week. I live just outside Lexington and was delighted to find a full set of metal cabinets (with the double drainboard sink) at the Lexington Habitat for Humanity ReStore. They are sold (for $978) but are still there awaiting pickup. In need of TLC, but still amazingly gorgeous! 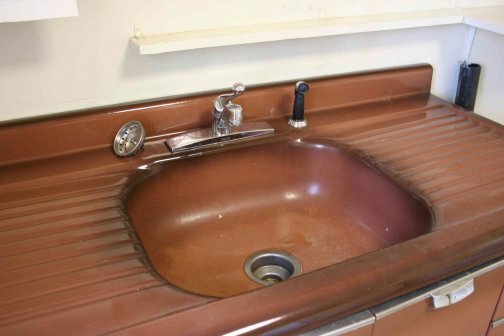 I also found 4 pink bathroom sinks there! I hope you enjoy your time in the Bluegrass state and our crazy weather – 60 degrees one day and snow the next! Well, they’re not the rounded chevrons like those pictured above, but you guys MUST know about Rejuvenation’s new “Satellite Modern” website and the fact that they’ve reissued the angular chevron/boomerang pulls, right? Happy almost spring to everyone! Yes – Satellite has a new line. Readers, you can see ALL cabinet pull recommendations by looking at “Categories” in the right-hand sidebar and clicking “Cabinet Hardware”. I picked up a large set (44 or 45) of the rounded boomerang pulls identical to the ones in the first picture on ebay last fall. I was trying to decide if I wanted to change out the original black and brass pulls in my kitchen. I don’t think I’m going to so now they are sitting with my growing collection, waiting for me to have some inspiration as to what to do with them. Glad to know that they were most likely on a set of Youngstown cabinets. I’m going with new kitchen and bath knobs from Atlas Homewares. They’re called Dap Round (small or large) and come in different finishes. I ordered the small (2″) in satin brass. They resemble the ones from Satellite, the concave style. I bought them from http://www.knobsandhardware.com for 7 bucks each.